Fred S. Bodker, M.D., F.A.C.S. Fred S. Bodker, M.D., F.A.C.S., is a board certified ophthalmologist who specializes in oculoplastics, which includes eyelid, tear duct, orbital, and cosmetic eye surgery, as well as reconstructive surgery and general ophthalmology. 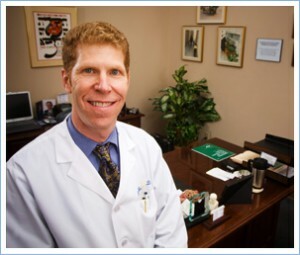 Dr. Bodker received his undergraduate degree from the University of Michigan, where he was a Phi Beta Kappa, and his medical degree from Johns Hopkins University School of Medicine in Baltimore. He completed an internal medicine internship at Northwestern University, and an ophthalmology residency and an ophthalmic plastic and reconstructive surgery fellowship at the University of Illinois at Chicago under the direction of Dr. Allen Putterman. He was accepted for membership in the American Society of Ophthalmic Plastic and Reconstructive Surgeons, an honor society of approximately 450 surgeons, in 1996. One of the few fellowship-trained plastic and reconstructive eye surgeons in Kansas CIty, Dr. Bodker is also a Fellow of the American College of Surgeons. 1992–1995 Senior Resident Research Project, Illinois Eye and Ear Infirmary. Advisor Allen M. Putterman, M.D. The effect of hyperthyroidism on Muller’s muscle function in rats. Using stereotaxic model to study Muller’s muscle function after pharmacologic manipulations. 1991–1992 Resident Research Project, Illinois Eye and Ear Infirmary. Intraocular dexamethasone penetration after subconjunctival and retrobulbar injections in rabbits. Used HPLC to assay the amount of steroid penetration into retina, choroid, vitreous, and aqueous at various times after injections. 1989 Summer Research Fellowship, Johns Hopkins Center for Hereditary Eye Diseases, Wilmer Ophthalmological Institute. Preceptor Irene H. Maumenee, M.D. Description of clinical manifestations and review of possible pathogenetic mechanisms using mouse models of presumed homozygosity of an autosomal dominant congenital cataract gene in the offspring of a consanguineous marriage. Linkage analysis of cerulean cataracts using red blood cell groups and enzymatic markers. Isolation of DNA and Southern blotting using restriction fragment length polymorphisms in autosomal dominant congenital cataracts. 1987 Medical Student Summer Fellowship, University of Kansas Medical Center. Preceptor Theodore Lawwill, M.D. Determination of wave parameters in appearance/disappearance pattern electroretinography of glaucoma patients. 1985 Student Research Fellowship, University of Michigan School of Medicine. Preceptor Michael Johnston, M.D. Effects of hypoxic-ischemic injury and monosodium glutamate on glutamate receptors of young rats. 1984–1985 Cancer Prevention Project, University of Kansas Medical Center. Preceptor C.C. Cheng, Ph.D. Synthesis of anti-cancer organic compounds and antioxidation screening to determine in vitro activity of products. Bodker FS, Cytryn AS, Putterman AM, Marschall MA: Postoperative mydriasis after repair of orbital floor fracture. American Journal of Ophthalmology 1993; 115:372–375. Bodker FS, Tessler HH, Shapiro MR: Ocular manifestations of Takayasu’s disease presenting in a Hispanic woman. American Journal of Ophthalmology 1993; 1 15:676–677. Bodker FS, Ticho BH, Feist RM, Lam TT: Intraocular dexamethasone penetration via subconjunctival or retrobulbar injections in rabbits. Ophthalmic Surgery 1993; 24:453457. Bodker FS, Olson JJ, Putterman AM: Acquired blepharoptosis related to essential blepharospasm. Ophthalmic Surgery 1993; 546–550. DeBacker CM, Bodker FS, Putterman AM, Beckmann E: Solitary Fibrous Tumor of the Orbit. American Journal of Ophthalmology 1996; 121:446–449. Bodker FS, Putterman AM, Laris A, Miletich DA, Vogel SM, Viana M: The Effect of Hyperthyroidism on Muller’s Muscle Contractility in Rats. Ophthalmic Plastic and Reconstructive Surgery 1997; 13(3): 161–167. Weiss R, Bodker FS, Friedman CD: Harvesting and Use of Autologous Tissues in Oculoplastic Surgery.In: Orbit Section of Principles and Practices of Oculoplastic and Reconstructive Surgery. Bosniak 5th ed. WB Saunders, Philadelphia, PA. 1995. Bodker FS, Lavery MA, Maumenee IH: The effect of homozygosity of the autosomal dominant gene for cerulean cataracts and linkage analysis. Scientific poster at American Academy of Ophthalmology meeting, October 1990, Atlanta, GA.
Bodker FS, Ticho BH, Feist RM, Lam TT: Intraocular dexamethasone penetration via subconjunctival versus retrobulbar injections in rabbits. Scientific poster at ARVO meeting, May 1992, Sarasota, FL. “Introduction to the Ophthalmologic Exam: A Guide to Emergency Room Management,” Seminar to Emergency Department residents, July 1992. “Orbital Sarcoidosis: A Clinical Pathologic Conference,” Illinois Eye and Ear Infirmary Grand Rounds, October 1992. “Floppy eyelid syndrome,” Illinois Eye and Ear Infirmary Clinical Challenges Day, March 1993. Bodker FS, Laris A, Cytryn AS, Putterman AM, Miletich DA, Vogel SM: In vivo measurement of Muller’s muscle contractility in rats. Scientific poster at ARVO meeting, May 1994, Sarasota, FL. “External Dacryocystorhinostomy,” Presented at national meeting entitled, “The Changing Face of Ophthalmic Plastic Surgery,” Kansas City, MO, June 7, 1996. “Update on CO2 laser skin resurfacing,” Kansas City Eye Clinic Grand Rounds, June 13, 1996. “Management of Common Oculoplastic Lid Lesions,” Kansas City Eye Clinic Grand Rounds, September 23, 1999. “Laser Blepharoplasty” and “Update on Eyelid Masses,” Kansas City Eye Clinic Grand Rounds, November 9, 2000. “Botulinum toxin injections,” Kansas City Eye Clinic Grand Rounds, November 1, 2001. Davidson RS, Maus M, Bodker FS, Chapman KL, Goldberger S, Harrison A, Holck DE, Holds J, Levin P, Mannor G, Patel BC, Rubin P, Lucas L: A Multi-Centered Study to Evaluate the Efficacy and Safety of Acellular Dermal Grafts in Lower Eyelid Reconstruction. Scientific poster at American Academy of Ophthalmology meeting, November 2001, New Orleans, LA. “Evisceration and its Complications: A 10-Year Review” Discussant for paper. AAO meeting, Orlando, FL, October 23, 2002. “Graves’ Orbitopathy,” Kansas City Eye Clinic Grand Rounds, November 11, 2005. “Approach to the Tearing Patient,” Kansas City Eye Clinic Grand Rounds, October 25, 2007.